UN Environment Website: How community action is helping vulnerable marine mammals stage a comeback in Madagascar. 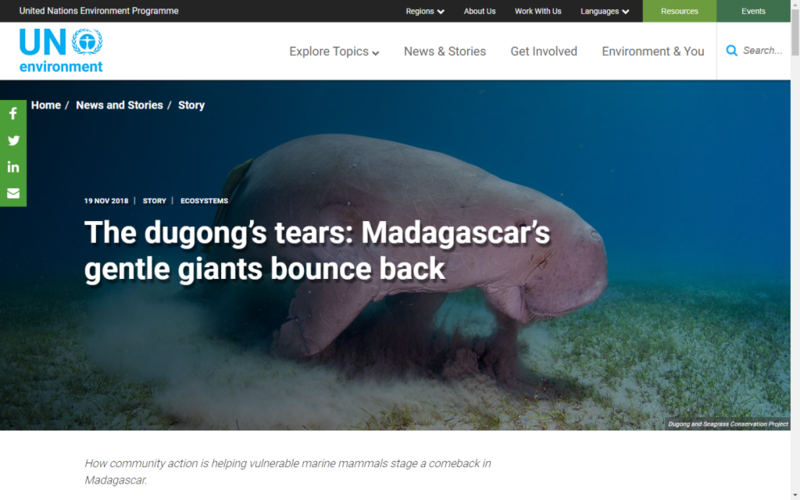 Once again, UN Environment website is featuring the dugong project – particularly the work of our Project Partner in Madagascar Community Centred Conservation. UN Environment: How community action is helping vulnerable marine mammals stage a comeback in Madagascar. …with over 1 million hectares of dugong habitat now under improved conservation management across 30 sites in Madagascar alone–and another 41 projects underway worldwide—these individual changes have the potential to stack up to big wins for the dugong and other species that rely on seagrass globally, including us. In addition to farming activities, C3 has provided greater access to healthcare to the local community – a service sorely needed in this remote area where previously the nearest clinic was a two-hour walk.